"It means a way of life for people who live in these communities, but the bottom line is that it creates a lot of jobs." Tourism leaders estimate more than one million visitors pour into the Mobile area each Mardi Gras season to watch the festivities. The city claims to be the place where the Fat Tuesday celebration originated in the U.S. back in the early 1700s. New Orleans and Mobile have long disputed where the tradition that dates to their French founders really began. Visitors to Mobile spend money at hotels, restaurants and stores during the celebration that can stretch on for weeks and includes dozens of parades, balls and other events. A 2004 study commissioned by the city of Mobile estimated Mardi Gras had a $225-million economic impact for the area and tourism leaders say that has grown as the festivities become more popular. "I would say tens of thousands of dollars are spent on the different beads and throws and things that are thrown off the floats. It really benefits every kind of retailer and the tourism industry," said David Randel, president of the Mobile Bay Convention and Visitors Bureau. "From a convention and visitors bureau standpoint, you hope people come for Mardi Gras, fall in love with the area and come back to visit again when the weather is better." In smaller towns like Fairhope, with population 17,000 in south Alabama near the Florida line, Mardi Gras is a big help. Heavenly Creations Bakery sold 1,500 traditional Mardi Gras king cakes in 2011. Owner Robyn Yoder hopes to beat that this year. The colourful cakes go for $9.99 for a small and $19.99 for a large. "Mardi Gras is good for everyone. I think it brings more people downtown and it brings more people in. It's a boost in sales and it does a lot for all of us, more tips for the girls who work, it's good," she said. Rosie Miller has sold Mardi Gras ball gowns to the women of the Gulf Coast for 30 years. She has thousands of gowns, most for under $300. "Poufy gowns this year are really in," Miller said as she pulled a gown from one the dozens of racks in a back room of her Mobile store on a recent morning. Miller said Mardi Gras gowns are usually over-the-top and are more fun than traditional formal ware. The store has vanloads of women from small towns all over the region who come to shop. Some buy five or six gowns for the various balls they attend during the season. "Mardi Gras has grown and grown and brings millions of dollars into our economy," she said, although she didn't have specific figures. In Pascagoula, Miss., crawfish are the local Mardi Gras delicacy and seafood retailers do big business, said city spokeswoman Robin Wood. "There is a lot of crawfish and beer served during Mardi Gras season, a lot of seafood eaten," she said. "Mardi Gras definitely a boost to our economy because you have people coming in for the events and you have people renting tuxedos for the balls and buying throws for the floats and things here locally." Other Mississippi towns including Gulf Port, Ocean Springs and Biloxi have their own events. Florida Gulf Coast cities add their own, more laid-back twist to the season with beach-inspired events often aimed at boosting tourism in the off-season. 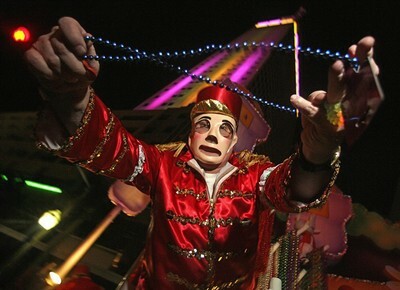 Pensacola, Fort Walton Beach, Destin and Panama City Beach have Mardi Gras festivities. People who might go to New Orleans for Mardi Gras sometimes drive east and include a beach trip to Pensacola, Fla., said Valeria Lento, spokeswoman for Visit Pensacola. Lento said Mardi Gras drives up the town's tourism numbers during its traditional pre-spring break down time. And the city offers lots of Mardi Gras activities to bring in tourists. Small towns all over the Gulf Coast have parades, balls and other festivities during Carnival Season. Pensacola Beach's 2012 Mardi Gras' Schedule includes 16 events from Jan. 7 to Feb. 21. Among them are a Moon Pie party, a red beans and rice lunch, a "Kids and Kritters" parade and a shoe box float contest. "Oh yeah, Mardi Gras is a ball, absolutely, it's fun," said Jill Jones, who dressed her Afghan hound up in a headband, jester collar and cape and wore a matching costume during the beach's pet parade this month.